Deep crimson, pincushion-like flowers are held high on slender, branched stems from July to September. 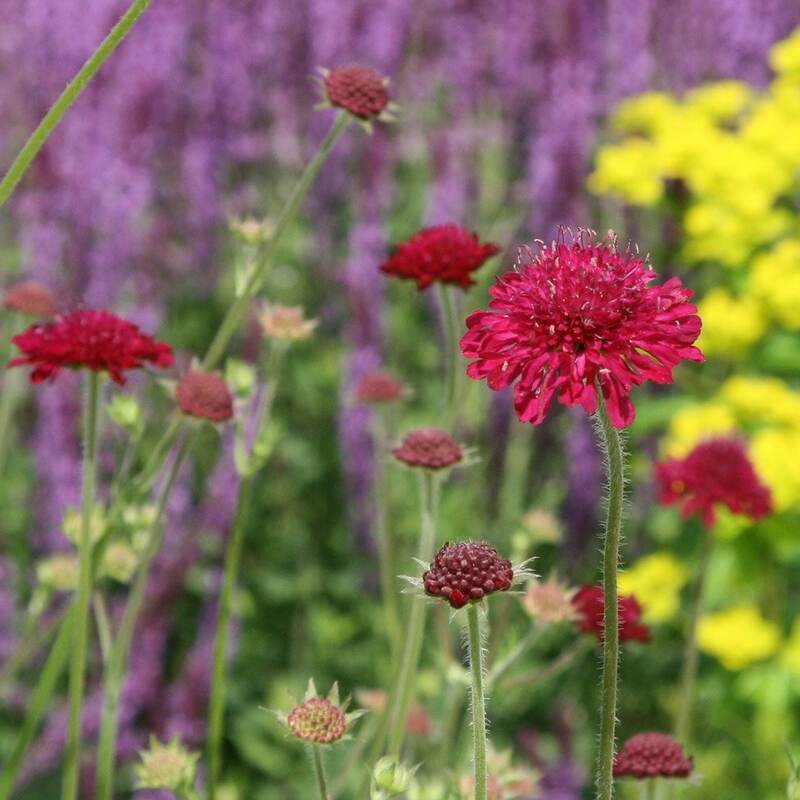 This popular, airy perennial brings long-lasting colour to a mixed or herbaceous border. 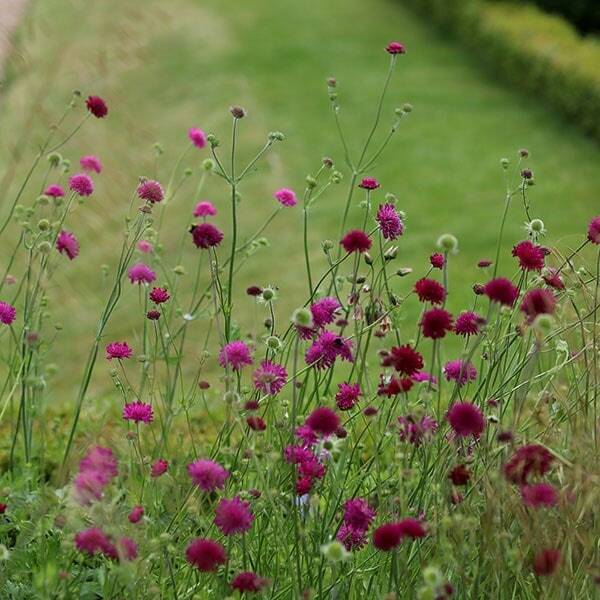 It's best planted in a well-drained soil in full sun and supported with twiggy pea sticks, since it has a tendency to sprawl. Although it prefers alkaline soil, it will thrive in neutral soil too. It is also a magnet for bees and butterflies. Garden care: Support with twiggy pea sticks or brushwood well before the flowers appear. Cut down to the ground in autumn. This plant is susceptible to powdery mildew. To help prevent this, mulch with well rotted manure or compost in autumn and keep it well watered. This is a lovely plant with a long flowering period. Very healthy plant and a good price too. I ordered two plants to add to existing clump, they arrived in excellent condition and very well packaged. They did flower the first year though not profusely but I expect that this will improve now that they are fully established. I'm determined to get a number of healthy plants in the garden because it's a good plant, beautiful colour & great for pollinators but the plants I bought last year struggled to get established during the hot dry summer so haven't clumped up as much as I would have hoped. I will persevere if they come though the winter & I have high hopes for them. This is a great plant, I bought 3, it has a really long flowering season all flowered into September and even in January I had odd flower here and there. Lovely colour, plants were incredibly healthy and true to the image. They are in a hot area in a raised bed, they are getting a bit mildewey now in January but they have self seeded which is great. They are not really affected by snails and slugs. Hello, I suspect that the wet weather has killed them off as although these plants can tolerate low temperatures, they must have well drained soil. Hi, I've just read that you should cut this down to the ground in autumn. I haven't done this and it's 1st February. Should I do it now?